Bands & Books Christmas Special, Friday 16th December 2011 at the Victoria. Molly Naylor is a writer, performer, poet and theatre-maker. Her solo show, Whenever I Get Blown Up I Think Of You debuted at the Edinburgh Festival Fringe in 2010 to critical acclaim, which proceeded an international tour. She was commissioned to write an audio adaptation of the show for BBC Radio 4, which was described by the Guardian as ‘a brave, funny, tough and beautiful piece of writing’. Her adaptation of the book of Malachi was staged at The Bush as part of Sixty-Six Books, published by Oberon. She has written for The Independent and her poems have been featured on BBC Radio and in publications including Rialto, The North, The Londonist and Pen Pusher. She frequently performs and reads at festivals and events worldwide. Her first book – an illustrated text of her live show - is available from Nasty Little Press. Molly also delivers workshops and lectures in creative writing, solo performance and poetry in education. She is currently developing a new show commissioned by Battersea Arts Centre. Nico, The Middle Ones, Nick Cave, The Smiths, Neil Young, Sam Cooke, Wave Machines, The Mountain Goats, David Bowie, Pulp and The Slits. And the Rednex, obviously. Well, we have no complaints about any of that, here is a Spotify mixtape just for you Molly! 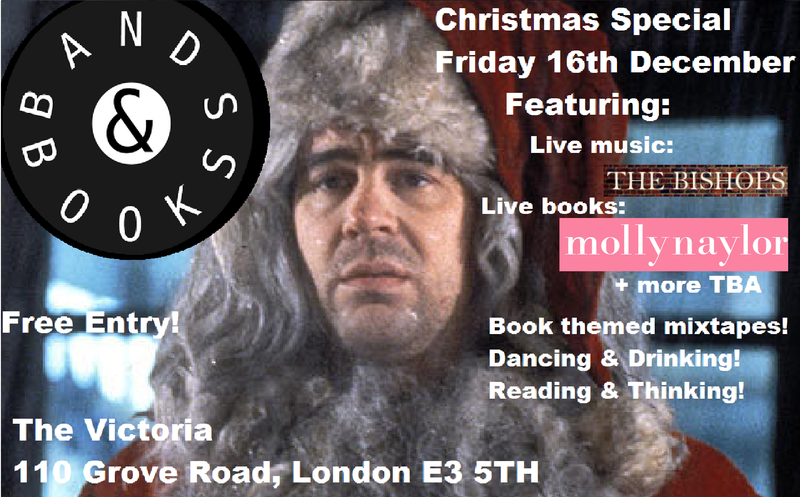 Bands & Books Christmas Special!